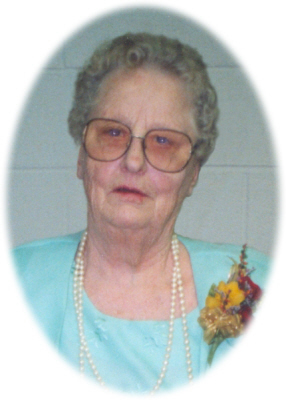 Greta Wilma Foster, age 92 of Ithaca, MI, passed away Tuesday, January 29, 2019 at Masonic Pathways, Alma, MI. Funeral Services will be held at Smith Family Funeral Homes Ithaca, MI on Friday, February 1, 2019 at 1:00 P.M., with Jo Jones officiating. Burial will take place at Pine Grove Cemetery, Emerson Township, MI. Visitation will be held on Thursday, January 31, 2019 from 2-8 P.M. with family present from 2-4 & 6-8 P.M. at the funeral home. Greta was born in Sumner, MI on May 25, 1926, the daughter of Willis and Elsie (Wolford) Plank. She graduated from Alma High School with the class of 1941. Greta married Leonard R. Foster on October 15, 1949 in Ithaca, MI. Leonard passed away on January 23, 1990. She resided most of her life in Ithaca. Greta had worked at Redmonds Manufacturing. She enjoyed going to the Ithaca Senior Activity Center. Greta was very talented in making wedding & birthday cakes. She was famous for her homemade bread, cookies, and fruitcake. Greta cared for many children in her home over the years. She loved knitting and crocheting towels, dishrags, afghans, and doing plastic crafts and ceramics. Greta loved playing bingo and was an avid game show watcher. She is survived by her daughter Diane and Waldo Hoskins of Kentucky; son Phil and Karen Foster of Ashley, MI; daughter Linda Holmes of Virginia; daughter Debora Shattuck of Ionia, MI; daughter-in-law Gayla Foster of Ithaca, MI; 14 grandchildren; 21 great-grandchildren; and many great-great-grandchildren. Greta was preceded in death by her parents Willis and Elsie Plank, husband Leonard Foster, 2 sons: Gary and Lee Foster, daughter-in-law Sandy Foster, son-in-law James Holmes, 3 sisters: Fern Williams, Marie Kellogg & Thelma Rountree, and brother Andrew Plank. Memorials may be made to the Senior Activity Building in Ithaca, 1011 E. North Street, Ithaca, MI 48847. Online condolences can be made at www.smithfamilyfuneralhomes.com. The family is being served by Smith Family Funeral Homes, Ithaca, MI.